It has been a busy time for Redbrick House over the last 6 months as our community has grown and developed! So we thought what a great time to ask some of our members and visitors to give us their thoughts. As a creative writer and a Redbrick House intern, this is Hannah’s view from behind her laptop! Tucked away in the cultural quarter of Bristol’s Stokes Croft, you will find Redbrick House, the newest home of PAPER Arts. This artistic location is perfect for summing up Redbrick. On my visits, I am greeted with decorative graffiti on the pavement outside with steps leading up to its colourfully painted door – a warm welcome in preparation for the creativity going on inside! Comfortably situated on the top floor is where I spend most of my time. This area is made up of open plan office space, sofas, a large hanging chair, decorative lighting, mellow music, large windows, a hidden away ‘snug’ and ample kitchen facilities with a table to eat your lunch at. A haven for those who need a space that will encourage their ideas to grow. 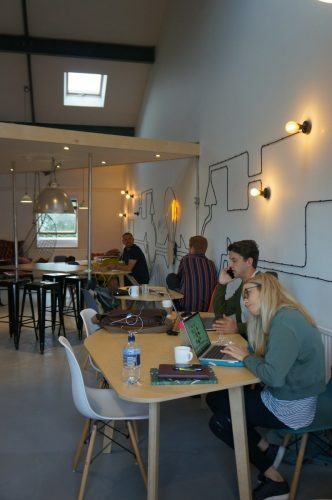 The building provides co-working space across three floors, offering a range of memberships to best suit your needs, including optional designated desk spaces just for you. I instantly absorbed Redbrick’s relaxed and sociable atmosphere, whilst noting that it would also be the perfect environment to get my head down. Most importantly, there is endless free coffee and cake. The three different memberships that this non-profit organisation provides are £60 a month for 30 hours, £100 a month for 60 hours or £140 a month for unlimited use, with the option to use meeting rooms or add a member’s friend day pass – all of which I believe to be at more than reasonable prices. These fees help the young creatives of Bristol to begin or develop their careers. Rather magically, Redbrick’s co-workers and the aims of PAPER Arts, work hand in hand to keep the imagination of Bristol alive and turn it into something beneficial or inspiring.